Sarah's Stamp Lab: Swallowtail Case with a Twist! 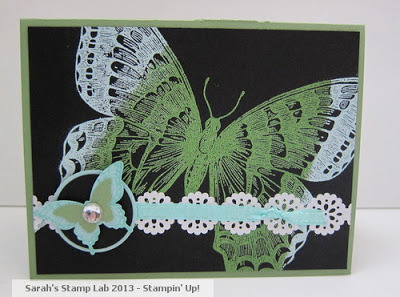 Today I have a card for you that I cased from the Stamp with Amy K blog. I really loved her design but I had to change it up to make it my own! This card is featuring the chalkboard technique. 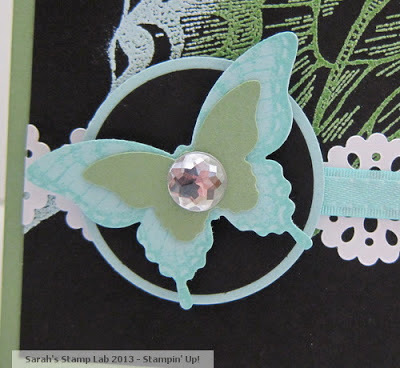 I love the look that embossing in multiple colors gives you. I think I'm going to have to try this more often. Here's a close up of the little butterfly medallion I made. I love the new Bitty Butterfly punch so much! Gorgeous. I'd love a tutorial on how you made this card.